The goal of National Reading Month is clear and fantastic. Simply, it’s all about helping children to love reading. It’s about getting kids in the habit of reading, even if it’s for as little as 15 minutes a day. Just that little bit of time is really helpful in helping your kids to excel at reading and to boost their love of it. If you know kids, then you know that they are all different. Some just take to reading and love it from the get-go. For others, it can be more of a challenge. However your kids are, it’s ok. You can work with each of them and get even the least interested kid into reading. It’s all about making it fun and exciting. National Reading Month is the perfect time to jump start that effort, so your kids have a love of reading now and in the future!! Need some ideas? Here are some things we do to get our kids reading! It sounds so simple, but in our busy lives, it’s not always an easy task to stick to. We try our best each and every day to set aside some time to read with our 6 year old, Caleb. Amazon Alexa really helps us all to stay on track and be more organized! Sure, there are times we have to miss it and there are times when Caleb wants no part of it, but most of the time we really try to stick with it. Many nights we go way past that 15 minute mark as we read book after book! I love those nights. We have our daughter Natalie (13) and older son Liam (11) get in on it, too! They either read with Caleb or read on their own in the living room with us as a family. Whatever they do, it really helps get Caleb into it! So I’m into it, too. I think it’s a safe bet to say that humans like to feel good. Even more than adults kids really like to laugh and have fun. when it comes to things like reading, if you are having fun, then they will be more likely to have fun, too. Reading time almost becomes like party time. So, when it’s time to read, do your very best to really make it fun for the kids. Make it an event. Get some funny gear, put on your best silly voice, and be loud, vibrant, and animated! Get the kids involved with all of the festivities, too. Psych yourself up for it, even on those days you simply just want to get through it. Just like you tell your kids, put your heart and soul into it…even on those days you don’t want to!! Again, duh, right? It seems so logical to have them choose, but sometimes I’ve found that we want to dictate to the kids what we want them to read. Maybe it’s to save time, maybe we think we know what’s best, or maybe we really do like certain books more than others. Whatever the reason, I think the kids take real interest and pride in the process of searching for the “perfect” book. Just let them do it. They take more ownership in the process and it make them that much more excited and happier to read! It’s all about them, and that’s a good thing. Depending on where your kids are in the reading process, let them move at their own pace. Sometimes we just want to read to them because it’s easier. I know, I get it. There are nights when we are tired, annoyed, or just not into it. That’s to be expected and it’s a part of life. It’s ok, don’t feel bad. But, while it can be tempting to do that, it’s just so much better to let them be involved. Take a deep breath and just try your best to block out the bad from the day. Enjoy the moment and really try to make it the best for you and for them. So it takes a few minutes more. Let them read as much or as little as they can. Let them point, comment, and be silly. They are kids and this is supposed to be enjoyable for everyone. So…let them be! Books are awesome and I love the feel of the paper and turning the pages. Kids do, too. But, let’s face it, this is the tech generation. It’s all about screens and apps, right? Well, why not use some of that tech to make it more fun for the kids to read?! There are so many options out there today, but there are always some apps or device that rise above the rest! 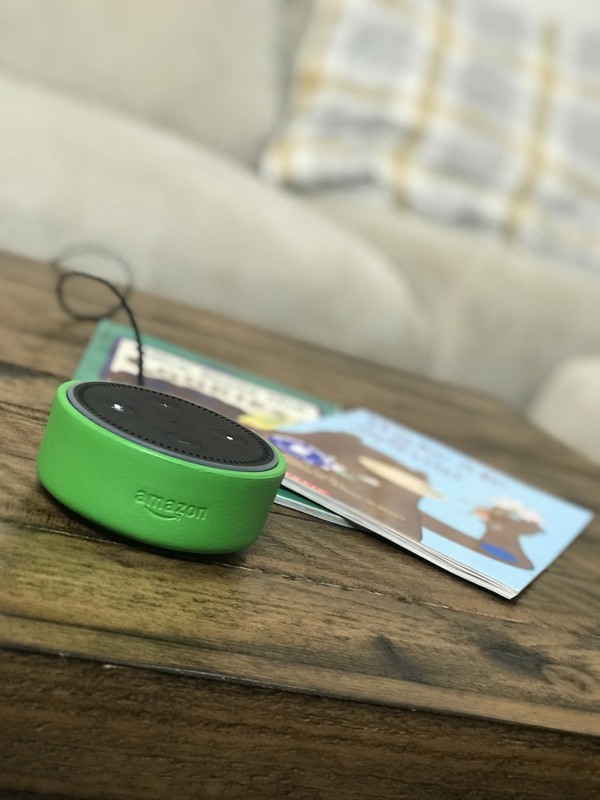 We love using the Echo Dot Kids Edition. There’s just so much to take advantage of, and it’s just so easy to use!! Let me tell you more about it. Alexa can do so many things. It’s quickly becoming an integral part of my family’s life. The cool thing for kids is that it can provide a fun and educational experience for them. 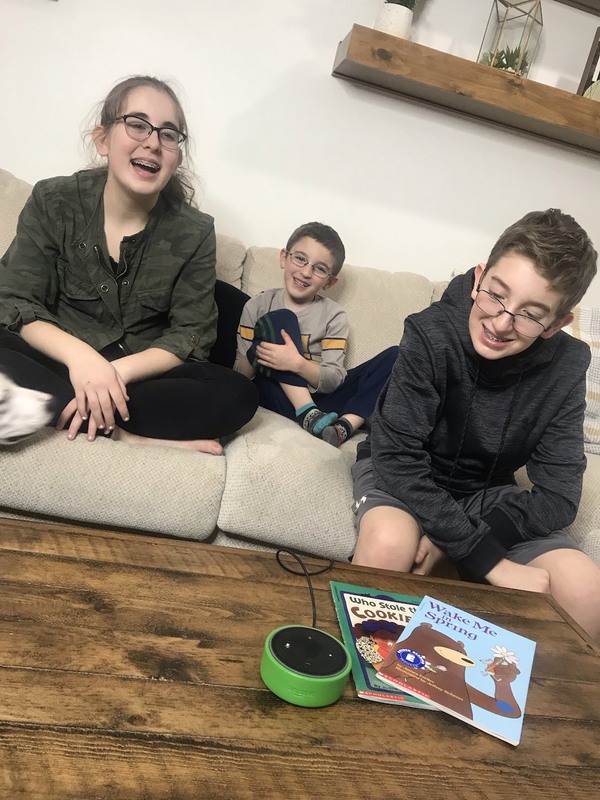 FreeTime on Alexa can provide a fun and educational experience for families through audio-books, educational skills and multi-player games, bedtime routines, educational Q&A and more!! One of the best parts about FreeTime on Alexa is the fact that we can share in learning and fun together. 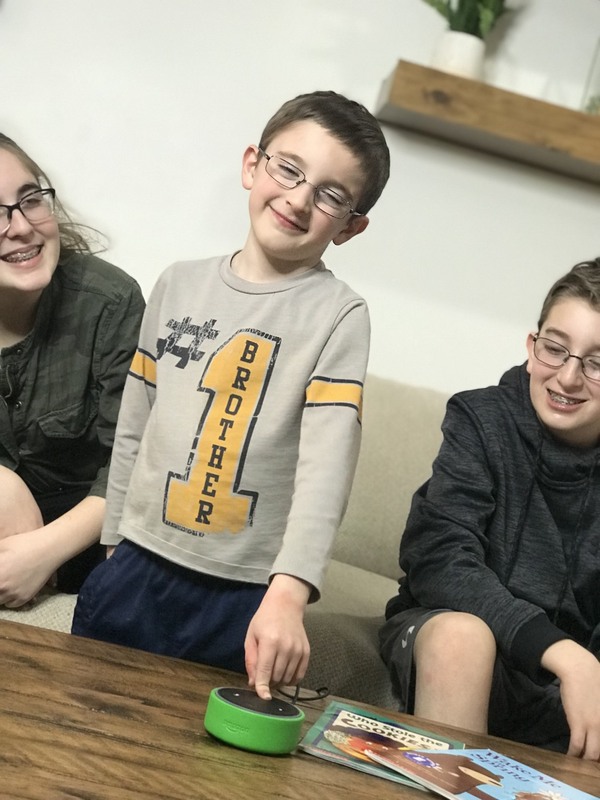 My kids love asking Alexa questions about, well, just about everything. They hit on science, math, spelling, definitions, or any other topic you could imagine. There are also a TON of kid-friendly Audible books you can call enjoy. It’s pretty amazing. I sound like an old man when talking about it…”when I was a kid we had to go to the library and look it up in books!” You can also expect Alexa to continue to get smarter and add new information every day. It’s such a fun, easy, and interactive experience. FreeTime Unlimited on Alexa includes over 1000 kid-friendly Audible books, kid-friendly, ad-free radio stations and playlists, character alarms, and premium Amazon Alexa skills that kids will love. Think Beauty and the Beast, Peter Pan, Nate the Great, and more!! This just puts my kids in orbit. There are so many options, it makes their heads spin…in a very good way! Imagine having all of this enjoyment right at the tip of your tongue?? FreeTime Unlimited on Alexa is available also available on Echo devices, including Echo, Echo Plus and Echo Spot starting at $2.99 per month. And, families that already subscribe to FreeTime Unlimited on Fire tablets or Android devices can enjoy FreeTime Unlimited on Alexa content at no additional cost. This is just a really great deal and value. There are so many things we pay for each month that aren’t nearly as good as this. Seriously. The internet can be great, but it can also be like the Wild, Wild West out there. Some really crazy and scary stuff can be found very easily on the interwebs. Not with the Echo Dot Kids Edition!! This kid-friendly, kid-centric Alexa experience sports some impressive parental controls with a Parent Dashboard, so I don’t have to worry about my kids using it when I’m not around. I almost can’t put a price on that level of comfort. It’s just a must for me and for my family. Awesome alert!! In honor of National Reading Month, it’s time for a giveaway!!! If you don’t already have the Echo Dot, or just love the and could always use more…I have some great news! Enter below for a chance to win One (1) of 10 Echo Dots. Hurry, though, the giveaway ends April 3. I-C will randomly select winners from all program entries and Amazon will facilitate fulfillment of the winning prizes of 10 Winners. Using tech like Alexa to make reading fun is a great idea. When you make it fun, you establish a love of reading in the kids that will last a lifetime. When I was a kid I remember how boring I found reading habit. Then slowly I started liking it. My parents had applied some of the tips shared above. These are really helpful! When fun is combined with the learning process, retention becomes so much earlier. Alexa seems to be the perfect answer. And spending time with the children helps to grow the bonding which is so much required in today’s fast paced world. I love how you said you need to be patient!! I love to read but not when I was a child why? Well it’s the fact on how much we were force to! It honestly amazes me all the different things you can do with Alexa. It seems like it can a be a tool used to make learning fun with kids for sure! We are obviously not using our Alexa to it’s full potential. We use it for music and reminders. This is really great for children not that much interested in reading and education. I’ve come across some products as well that are being integrated with Alexa and other voice products in the market. I had no idea it was reading month. My kids would love this. I never knew Alexa could do so many things! I will definitely be checking out the FreeTime Unlimited! Wow we really need to invest in one! We have a regular dot but the kids version would be amazing! My baby is just a year old but she loves reading. Alexa looks more fun and engaging with loads of options to choose from. Alexa is an amazing device. Now I can see how effective it can be for learning with kids. This is just amazing! I might want to get one for my niece and nephews. It will help their reading time.